Dr. Benjamin S. Chack attended the University of Pennsylvania and received a Bachelor of Arts Degree in 1980. Following that Dr. Chack attended Philadelphia College of Osteopathic Medicine and completed his medical training and residency at PCOM. 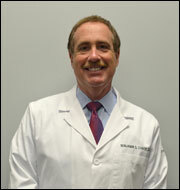 He has been practicing Otolaryngology since 1989 in the Bucks County area. Dr. Chack is Board Certified in Otolaryngology and Facial Plastic Surgery. He also is a Fellow of the American Osteopathic College of Otolaryngology and Head and Neck Surgery, and he is a Fellow of the American Academy of Otolaryngology and Head and Neck Surgery. Dr. Chack serves as Chairman of the Division of Otolaryngology in the Aria HealthCare System, and Cancer Liaison Physician at the St. Mary Medical Center, in Langhorne, PA. He also is a Clinical Assistant Professor of Otolaryngology and Head and Neck at the Philadelphia College of Osteopathic Medicine. Dr. Chack resides in Bucks County with his wife and two children. The Patient Portal will be down from 2AM - 4AM every morning for system maintenance.